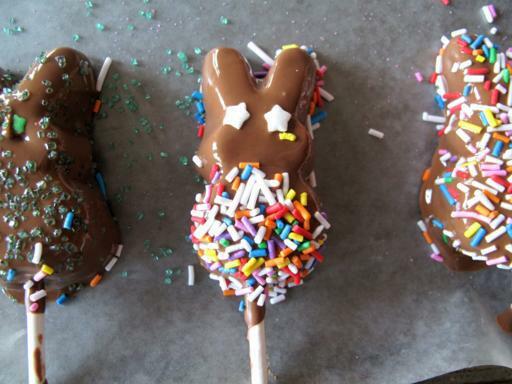 Chocolate Dipped Marshmallow Peeps are the best Easter treat around! 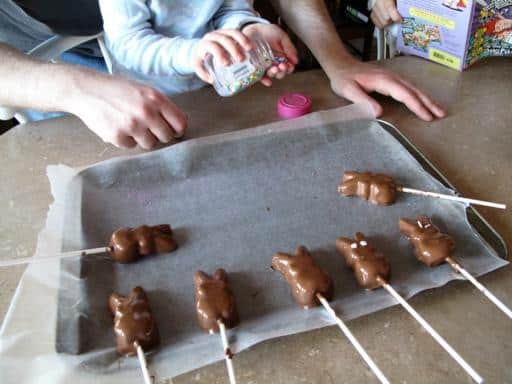 You stick them onto a stick, dip them in chocolate and then decorate them as you like! My whole site is just going to be taken over by food this Easter weekend and that’s ok. 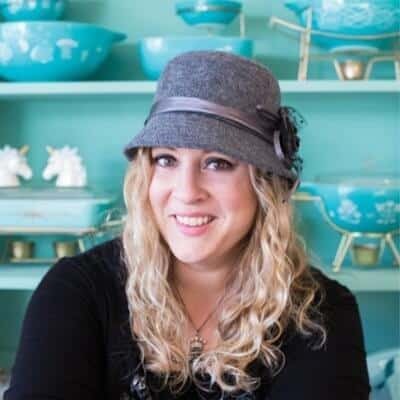 I get a little crazy around the holidays and I love to make food. Holidays bring out the best in me regarding my cooking and creating and also justifies my purchase of a $700 treadmill last fall. 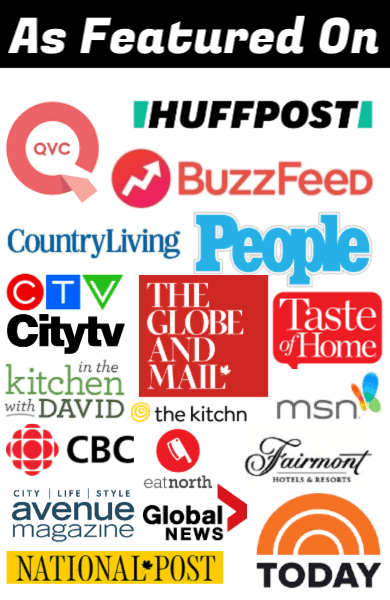 It’s going to be creaking under me on Monday morning and it’s thanks to these Peeps! Since you can make marshmallow snowmen for Christmas, why not Peeps? The company does make them but I though phhhhhht, I can make these at home! *ahem* and I had a bag of 100 sucker sticks that I needed to start using. It’s one of those purchases. I saw them in Michaels and like the kitchen magpie I am, thought oooooh!pretty!fun!make candy on a stick! bought them and left them in my cupboard for a few months. I like proving my husband wrong. It usually doesn’t take me a few months to prove that I am right, that I will use one of my usual flighty purchases and show him who’s the boss. Don’t worry, I still have been the boss the last few months. Just not over the candy sticks. 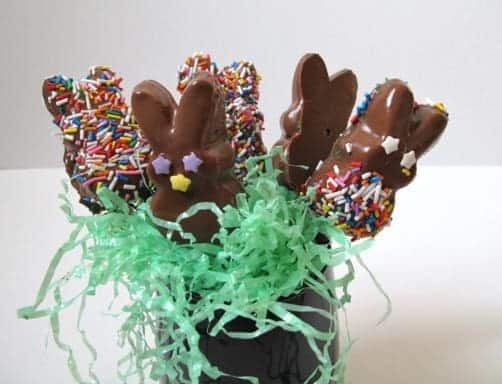 This is fun, easy, simple, was absolutely wonderful to do with my kids for an Easter activity and best of all, I used some of my 100 lollipop sticks. Only 93 remaining. I take suggestions . I liked the bunnies. In fact, they are what inspired me to try this in the first place. The chicks are the ones coated in chocolate, but I saw the bunnies and a lightbulb went off. You can still tell what they are shape-wise even after the chocolate is on, which rocks my socks. So. Stuff a stick into the rabbit. They stay wonderfully since the marshmallow is so sticky, a complete success. Melt your chocolate in the microwave. Dip ze bunnies while they cry for mercy. Mwhahahaha. Let the kids decorate. We used sprinkles, colored sugar, left them plain, gave them a set of eyes etc etc. Tell me this isn’t the cuestest freakin’ thing you have ever seen in a chocolate. Hey, have I ever mentioned what I do with my leftover chocolate from melting? I put a ziplock into a cup, then pour the remainder of the chocolate in it. I throw it in the freezer and pull it out next time I need melting chocolate. I always over estimate and there is nothing more sinful than wasting chocolate. 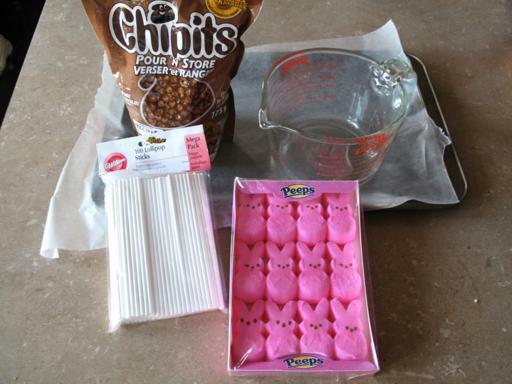 Place the peeps into the fridge and let them harden. These would be an adorable gift in a pot with foam or a treat to take to a party. I love things that look so good yet are so easy. And these are good, so so so good with milk chocolate on them, Mike and I were worse than the kids eating these! Can someone have an Easter party so I can bring these? 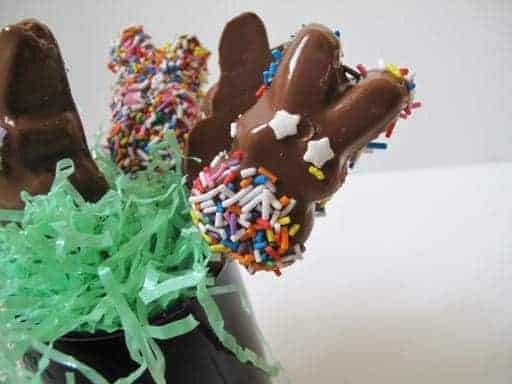 Chocolate dipped Easter peeps that are then decorated with sprinkles. Cute! Line a large baking sheet with waxed paper. Stuff a stick into the bottom middle of each rabbit. They stay wonderfully since the marshmallow is so sticky. 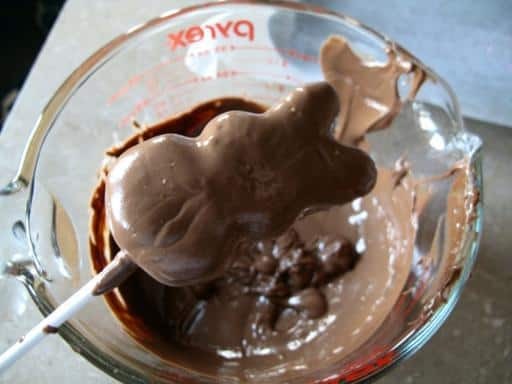 Melt your chocolate in the microwave in short bursts, 30 seconds each, stirring between each. 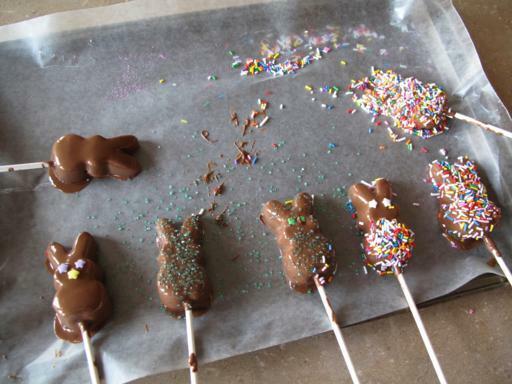 When it's completely smooth, dip the bunnies into the chocolate, letting the excess drip off. Let the kids decorate. We used sprinkles, colored sugar, left them plain, gave them a set of eyes etc..Place the peeps into the fridge and let them harden. These would be an adorable gift in a pot with foam or a treat to take to a party.